Home / DIY / Do You Need A Jigsaw For Your Home? Jigsaws are some of the most versatile tools that you can buy for your home, and you must find a jigsaw that will help you complete your home projects faster, more easily, and without worries about safety. A jigsaw could change the way that you do work around the house, and you might find that the jigsaw is much easier to use because it was designed to give you all the options you need. Plus, there are special tools that you can use with a jigsaw to give you more cutting options. A jigsaw is one of the essential tools for both beginner and advanced DIYers and woodworkers. There are many different types of jigsaws and models, with different features, pros, cons and uses. 1. What Is A Jigsaw? 2. How Do You Use A Jigsaw? Many different types of jigsaws are available on the market, and they are sized differently depending on how much power you need. You could purchase a small jigsaw that will help you work on smaller projects that need more precision. You could choose a large jigsaw that will help you power through larger and heavier objects. You simply need to look at the power rating on the saw along with how large it is so that you can get the most value from the saw. A jigsaw will help you work in small spaces, and you will find that you could use the jigsaw when you have something attached to a workbench or sitting on a surface that gives you room to work. You can hold the jigsaw in two hands so that you can control the cut that you get, and you will notice that the jigsaw is fairly easy to use so long as you have the right blade. There are many blade options online that will allow you to cut through different materials, and you must invest in enough accessories to make your life easier. You can get an angled plate that will allow you to make mitre cuts on the saw, and you will find that you could cut at any angle that you want. You also need to be sure that you have found a plate that will be large enough to keep you stable on that surface. You should use the plate so that you can cut at specific angles, and you will put together your projects much more easily. Jigsaws are very safe to use because the blade faces away from you, and the blade does not move that far as it reciprocates. You should wear goggles to use these saws, but they will not kick up much sawdust because the plate underneath will cause most of that sawdust to fall to the floor. Be certain that you have taken these simple precautions when it is time to use your saw. Creative cuts on the device allow you to create curves, and you will find that you could cut any angle or shape. You can drag out a long cut to the place that you need to go, and it is very easy to follow the line that you have drawn on your material because you can see through the little gap in the plate. The jigsaw that you have purchased will help you get the most projects done around your house, and you will notice that it is much easier to hold. 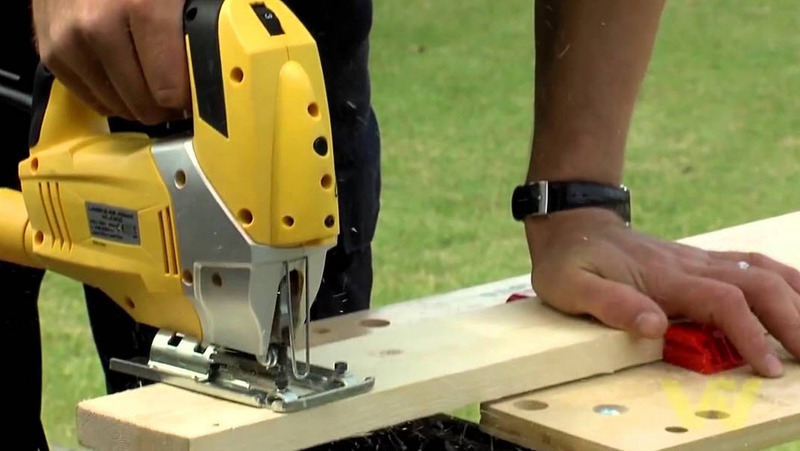 The saw takes up no space at all, and the jigsaw can be carried anywhere that you want. You do not need to buy a lot of tools because you can simply purchase the jigsaw online for less money. Get some extra blades, and you can begin work on your next home improvement project.